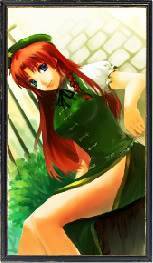 Appearance: Eden is 5’5” with long red hair, sometimes lying in loose curls across her shoulders other times pulled back in a braid or pony-tail. Her blue eyes so bright they seem to glow as she looks at you. Her figure is neither too full or to lean, but average. Besides her eyes she is easy to overlook with her rather plain features and shy demeanor when in crowds. Her preferred clothing is leather boots, jeans and comfortable cotton top, though you are just as likely to encounter her in dress if she is in the right mood. Personality: Shy, calm and fun loving and sometimes silly. She rarely raises her voice, and is not quick to anger preferring to find a logical solution to a problem instead of one involving fisticuffs. She is devoutly loyal to family or friends, and will not hesitate to battle if forced to protect them. Biography: She grew up outside Solaceon on a small vegetable farm. Her father, a semi-retired vet and scientist, worked part-time at a nearby Pokémon ranch to bring in extra money. Her mother taught her all the things a girl should know, cooking, sewing etc. Though a tom-boy at heart she spent just as much time in the forest and the farm, enjoying the solitude of long walks amongst the trees or the satisfaction of a weed-free garden. A child of nature she came to love the land and its creatures, comfortable climbing a tree one minute or cooking a gourmet meal the next, she is both odd and complex at the same time. Eden posses an unusual gift, in her family history there have been members who were able to telepathically speak to and understand Pokémon. The talent skips several generations, seemingly appearing at random, perhaps due the cycle of the moon or what flower was in bloom at conception, Eden has been blessed with this ability. One summer day her father came home from the ranch with a surprise for her, no sooner did he get the words out of his mouth, then a tiny head popped out from under his jacket. 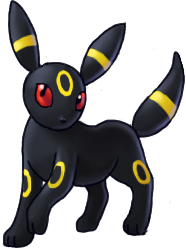 One of the Pokémon had just had a litter of Tepig and this one was the runt, so small that the rancher would rather give him away than try to raise him, saying “A runt like that won’t amount to nuttin”. So her father scooped the little guy up knowing Eden would take good care of him. Not long after that she was walking Malkier in the nearby forest and heard something scuffling in the leaves nearby, being alone she and Malkier hid behind a tree, only to see a lonesome Eevee searching for food. Wild and shy the Eevee looked quite hungry, so she set a trap, baited with something he couldn’t resist and waited. Timid at first the Eevee looked at the trap curiously, but eventually his stomach got the better of him and he wandered in. Upon capture he shook with fear, but after some soothing from Eden he quickly came to trust her, and now rarely leaves her side. For her 17th birthday, her mother, getting tired of her tom-boyish ways and fearing her daughter would never find a man if she didn’t change, gave her a Cherubi for a gift. A Cherubi who was so proud of her appearance, that her mother hoped some of the feminine qualities of the pet would wear off on her daughter. Well some of it did and Eden started wearing her hair in different ways and putting on the occasional skirt, liking the way she got noticed when she did. She also came to enjoy helping Cherubi keep up her appearance. Lying in the yard soaking up some sun next to Aryth, she suddenly found herself soaking wet, and looking around she heard a small voice laughing. Aryth started getting mad her face growing even redder and as she got angrier more clouds gathered over her head, rain falling faster down upon her. 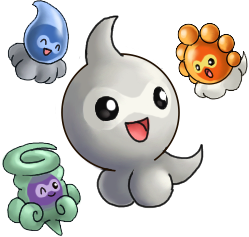 Eden slipped aside to locate the source of the laughter, and stumbled upon a Castform, laughing so hard at her antics that she didn’t notice until too late that Eden was behind her. Eden captured her easily as the rain continued to pour down on Aryth. Now just turning 19, she has decided to sling her pack over her shoulder and take her Pokémon out to explore the wide world. Being the runt of the litter, he feels he has much to prove, and works hard to act bigger than he truly is. He has a large personality always charging into battle, unafraid of stronger opponents. He can be a bit boastful at times, enjoying his victories. But has a good heart and loyal spirit, always wanting to be in the center of the action and help whenever needed. He loves to roll in the dirt and dig for roots with his snout when not doing battle. Extremely curious yet shy, he is devoted to Eden. It takes him awhile to become comfortable around someone new but once he does he becomes quite playful and enjoys being close to people and Pokémon alike. 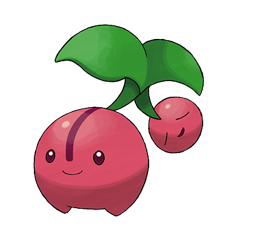 A cuddle monger in peaceful times he is always close by nuzzling or looking for a familiar lap, in battle he would defend to the end, giving his life to protect his trainer. Sweet and always happy, Aryth spends a lot of time on her appearance, sunbathing to give herself the deepest red color, and eating only fresh fruits and vegetables to keep her skin shiny and firm. To those who don’t’ know her she can come across as a bit arrogant, always talking about herself and appearance, but she is quick to give tips and offer a friendly hand. Battle is not her strong suit, and will usually run rather than risk scarring her pretty face. Ever been outside enjoying the sunshine, only to find a sudden cloud-burst above your head causing rain to soak your clothes? If so you were probably the victim of one of Cora’s jokes. She loves to play and tease others, using her weather control not only in battle but to drive her friends and trainer crazy at times. While she is usually happy-go-lucky she does take competition very seriously, and at times can seem to be in her own little world as she plans and schemes the next big thing.